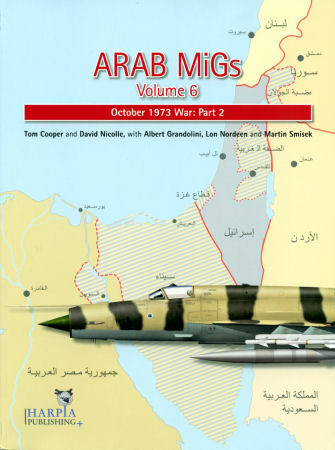 The sixth installment in Harpia’s brilliant Arab MiGs series resumes accounts of aerial actions on the Syrian and Egyptian fronts during the October 1973 war. Coverage commences with the usual “addenda/errata” to previous volumes. That’s where authors typically unearth some real gems – including, in this case, a shot of a Syrian FIAT G.59 with spiral-painted spinner! The superb study then segues to 1973 combat. And whereas Volume 5 covered the first couple days of the October War, this one picks up from there. It’s spiced with dozens of absorbing anecdotes – and some rather piquant perspectives. Chapter 3 – “The Myths of 14 October” – perfectly illustrates the latter. Authors dispassionately dissect putative force levels, systematically survey aerial victories and effectively illumine combatant missile programs. Similar scrutiny attends analyses of mission statistics and victory claims in Chapter 7 – “The Long Way to Peace”. Whether readers agree or disagree with Harpia’s conclusions, the authors confidently challenge widely held assumptions with laudable logic – and serious sleuthing. And until scholars enjoy unfettered access to official archives of all belligerents, Harpia’s methodology remains our best available option. The fierce fighting almost led to a “major military confrontation” between the United States and the Soviet Union. And that section seamlessly segues into sidebars on Israeli nuclear capabilities. But the curious claim that Israel “never faced” enemies who “have sworn to try to destroy it and ‘sweep Israelis into the sea’” bluntly beggars belief. Equally perplexing pronouncements occasionally accompany anecdotal accounts. Anyone familiar with military After Action Reports (AARs) knows how questionably accurate personal recollections can be. As before, authors don’t restrict coverage to “MiGs”. So in addition to requisite Sukkhoi, Ilyushin and Mil types, this installment helpfully highlights key warplanes in 1973 Arab arsenals. Libyan-owned Mirage 5s. Iraqi MiG-17PFs – called “MiG-17bis” by Baghdad’s expeditionary airmen. Even Moroccan F-5As, Iraqi Hunters and, with Israel’s invasion of Africa, Egyptian L-29 Delfin for close support trainers. All those offer hobbyists dozens of pungent project possibilities. Add author Cooper’s outstanding profiles – many, thankfully, with familiar US Federal Standard FS595 color notations. And Volume 6 will certainly motivate your modeling muse. Maps and diagrams splendidly enhance narrative details. Hundreds of rare color and B&W photos also illustrate Harpia’s impressive effort. How about those odd Syrian roundel proportions on page 80? Or that Egyptian 250kg bomb rack installation on Mi-8s? And all those savory camouflage schemes! Don’t ignore chapter endnotes, either. They admirably augment text, analyses and understanding. Nitpicks? That’s MiG-21F-13 “5846” on page 162 – not “5842”. The selected bibliography sports some questionable secondary sources. Camouflage pattern on that “ex-East German” MiG-21M “after delivery to Syria” perfectly replicates a standard Egyptian scheme. And Egypt and Israel signed a peace treaty peace treaty in March 1979 – not in September 1978. Harpia has earned scintillating repute with this seminal series. I’ve said it before: Arab MiGs deserves pride of place in every enthusiast’s library. Grab all six terrific tomes.